Please be advised that construction on Highway 579 near the hotel could cause delays. We apologize for any inconvenience this may cause. 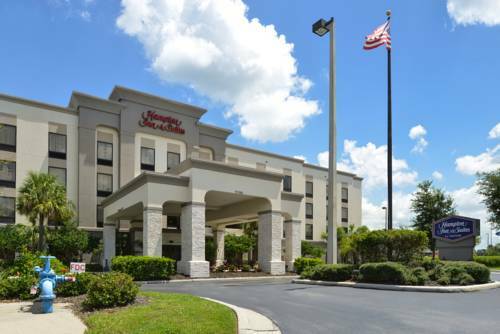 The Hampton Inn - Suites Tampa-East FL hotel is a lovely hotel conveniently located at exit 10 on I-4 in Tampa Florida within 5 minutes from Ford Amphitheatre Florida State Fairgrounds Bob Thomas Equestrian Center Hard Rock Casino and Tampa/Ybor City Entertainment District. Our hotel is also close to Historical Plant City and the Florida Strawberry Festival. The spacious rooms and studio suites of the Hampton Inn - Suites Tampa-East FL hotel provide a relaxing atmosphere whether you*re traveling to Tampa for business or pleasure. Guestrooms of our Hampton Inn hotel feature complimentary high-speed internet access and local calls a coffee maker iron ironing board hair dryer remote-controlled color cable TV microwave and refrigerator. Along with earning Hilton HHonors Points and Miles guests of our Hampton Inn hotel in Tampa Florida will enjoy a complimentary breakfast exercise facility outdoor pool guest laundry 24-hour suite shop 24-hour front desk message and fax service complimentary wireless high-speed internet access in our hotel lobby and no charge for children under 18 when accompanied by parents. All stays are backed by our 100 satisfaction guarantee. If you*re not satisfied we don*t expect you to pay. That*s 100 Hampton./TM/ We love having you here in Florida at the Hampton Inn - Suites Tampa-East hotel. There are no Meeting Rooms at this hotel. - Rooms To Go Distribution Ctr.